Ice cream is good stuff. It’s dessert, to be sure, but it’s dessert with the magical ability to transform a day for the better by its mere proximity to a spoon and your mouth. 3 Ingredient Strawberry Ice Cream is exceptional even within the delicious halls of the wonderful world of ice cream. What makes it different? 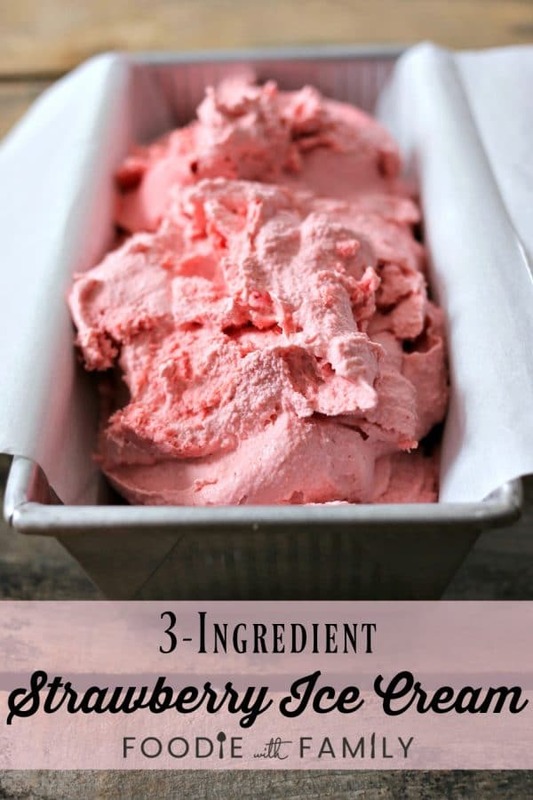 Let’s begin with the obvious: 3 Ingredient Strawberry Ice Cream only has, SURPRISE, three ingredients. Heavy cream, frozen sweetened strawberries, and a little balsamic vinegar is all it takes for luscious strawberry ice cream that churns up thick enough to scoop and devour right away. Don’t look at me like that. Yes. I put vinegar in my ice cream and it’s delicious. See the Cook’s Notes for details. That’s another one of those lovely little ol’ features and benefits of 3 Ingredient Strawberry Ice Cream. Most homemade ice creams churn up to soft serve consistency, but 3 Ingredient Strawberry Ice Cream is pretty close to hard-scoop when it’s done. In other words, you can grab a spoon and have at it. We did. The reason behind this little bit of unusual ice cream behaviour is that 3 Ingredient Strawberry Ice Cream is heavier on the fruit than most strawberry ice creams. 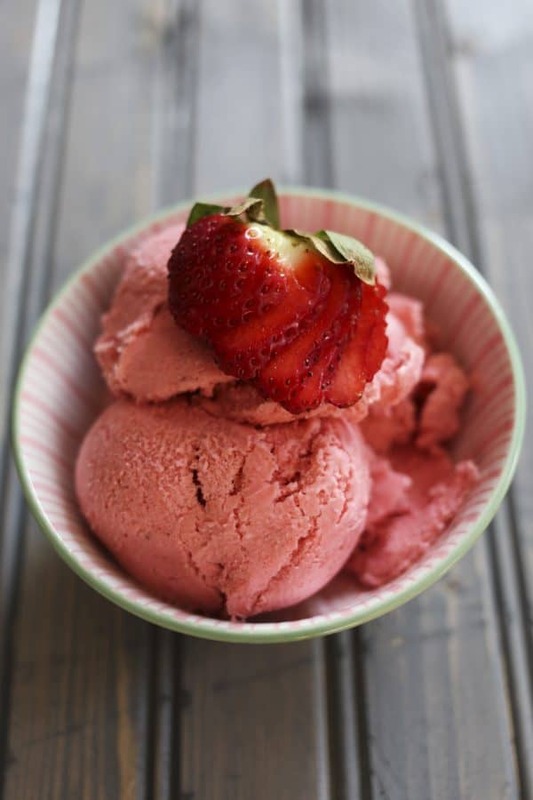 Blended ’til smooth (or just shy of that if you like recognizable bits of strawberry throughout your ice cream), 3 Ingredient Strawberry Ice Cream is what the love child of sorbet and ice cream would be making it a strawberry lover’s dream. It was so good fresh that I had to beat the menfolk back from the dish with a wooden spoon so that I could save enough to test how well it froze. The verdict? We all preferred the freshly churned ice cream, as this froze up quite hard, but nobody refused to eat the ‘ripened’ ice cream. It’s important that you use the variety of frozen strawberries that are sliced and sweetened and in a tub. The sugar the strawberries are packed in provide the sweetener for your ice cream. Adding balsamic vinegar to strawberries makes strawberrries taste more perfumey and sweet. It may seem counterintuitive, but look for more details here in this post on strawberry freezer jam. I promise you will be a convert! I prefer to puree my strawberries completely before adding in the heavy cream because I like a smooth strawberry ice cream. If you want a little more texture, you can pulse rather than blend the berries to preserve more pieces of strawberry. Don’t blend the heavy cream in for longer than 30 seconds… you don’t want to whip the cream, just fully incorporate it! 3 Ingredient Strawberry Ice Cream is best when freshly churned, but can be stored tightly packed into an airtight container in the freezer for up to a week. Let the ice cream sit at room temperature for 10 minutes or so before scooping if you do freeze it. 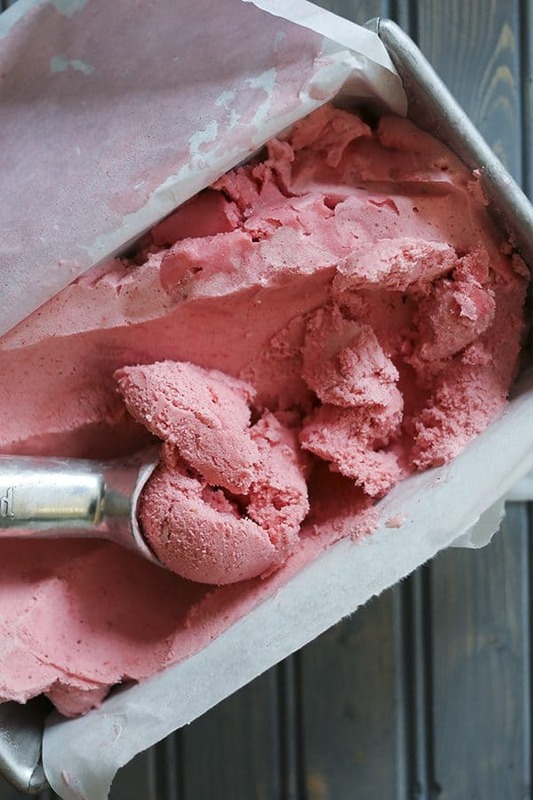 Do you love this 3-Ingredient Strawberry Ice Cream? Check out these other homemade ice creams! 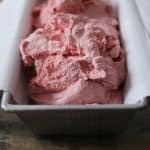 3 Ingredient Strawberry Ice Cream 5 minute method yields creamy, smooth, ever-so-strawberry-y ice cream with a minimum of effort. Simple, creamy, divine! Add the thawed strawberries and all of the liquid to a blender and blend until smooth. Pour in the heavy cream and balsamic vinegar and blend on HIGH for 30 seconds. Pour directly into your ice cream freezer and churn according to manufacturer's instructions. This ice cream is best if eaten immediately, but can be packed into an airtight container and frozen for later. This post was originally published April 11, 2015. 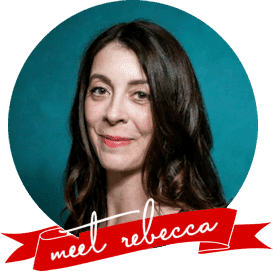 Updated Cook’s Notes and photos April 2018. I did just that. You can’t get frozen sweetened strawberries where I live, so I used some fresh strawberries (try to get some really nice and ripe), macerated them with sugar for a few hours, then took all the liquid and left only the fruit and a bit of sugar (I reserved the liquid and used in a smoothie 🙂 ) I used a hand mixer to puree the sliced strawberries, so there were some bits of fruit here and there (we like that, so no probs). Whipped the cream, mixed all together and off to the freezer! It does freeze hard, but you leave in the fridge before eating and it’s perfect.You can use less sugar depending on how sweet and ripe your strawberries are. Mine were a mixed lot, some were really sweet, some not so much. And also, of course, it will depend on your taste! I used 1 K strawberries, 650 grams sugar and 300 ml cream. Hope it’s useful! 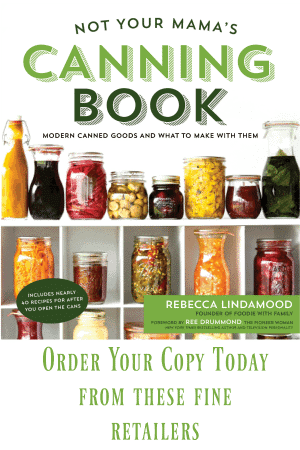 This looks wonderful and I love how you used frozen berries – much more economical! Could you make this with other fruits? Thanks! If you add a teaspoon or two of vodka, I will not get so hard in the freezer. Pass me a GIANT spoon! Looks amazing. Oh Wow!!! As I Love strawberry flavor …I have asked my mom to make it for me…It was lovely Though the color was slight different..That is may be due to changes of color in picture or reality…..
Each batch of strawberries has a different colour, naturally, too. The hue differences are quite likely a combination of lighting and natural variety!